1.- Blow up a balloon and knot the end. Turn the radio off. Hold the balloon between your hands. Put it against the front of the radio’s loudspeaker. What can you feel ? (The balloon should not move). 2.- Turn on the radio. 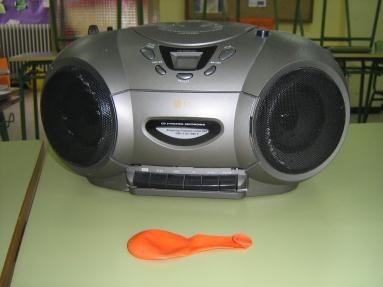 Hold the balloon against the radio’s loudspeaker. What can you feel ? (You should feel the balloon vibrating). 1. Screw up the kitchen foil into a ball and tie a piece of thread around the foil. 2. Put a wine glass on the table. 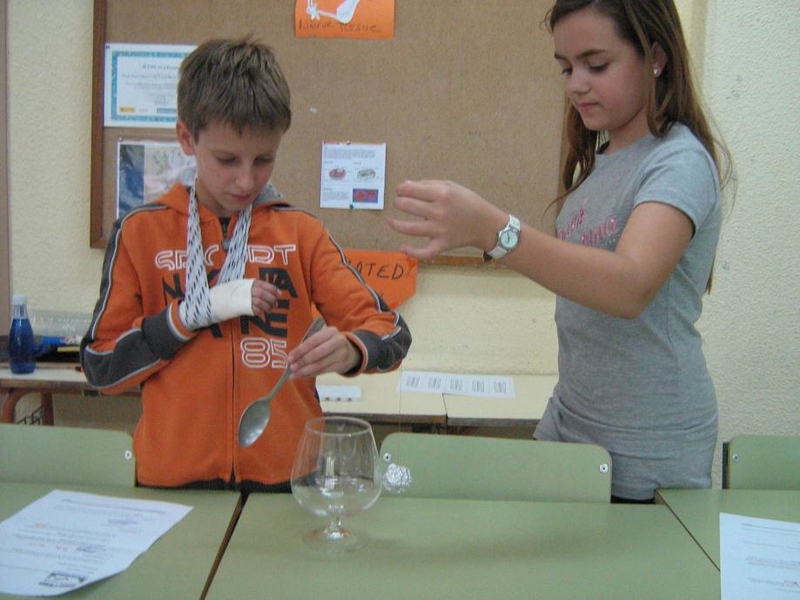 Hold the thread so that the foil ball just touches the glass. 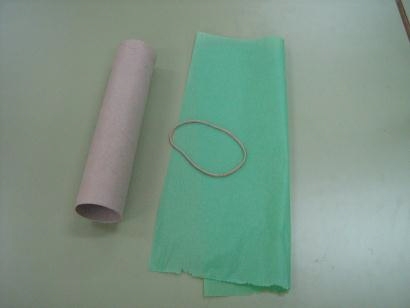 1.- Stretch the piece of tissue paper over one of the open ends of the toilet paper roll and keep it in place with the rubber band (The paper must be tight and flat). 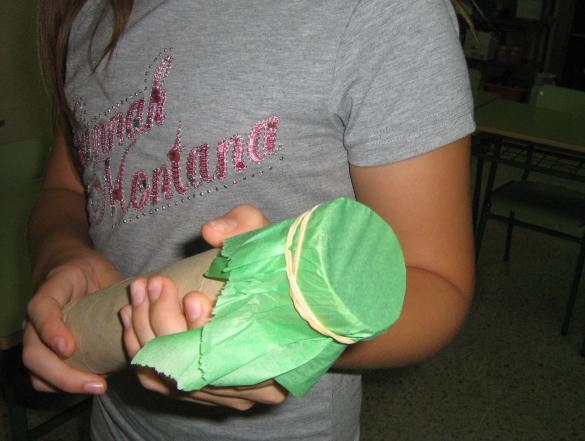 2.- Hold the toilet paper roll next to your mouth and put your fingers lightly on the tissue paper. 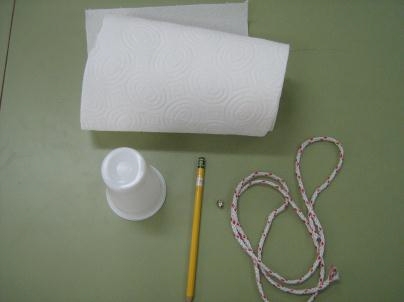 Sing through the toilet paper roll. Can you feel the vibrations ? (When you sing, vibrations from your vocal cords travel through the air in sound waves). Can sound travel through liquids ? Tap two spoons together in a bowl of water. Can you hear anything ? 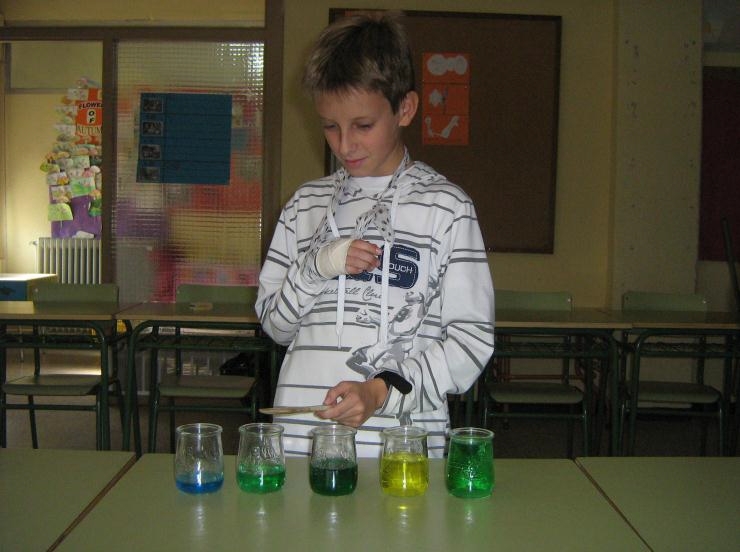 (This tells us that sound must be able to travel through liquids). Can sound travel through solids ? 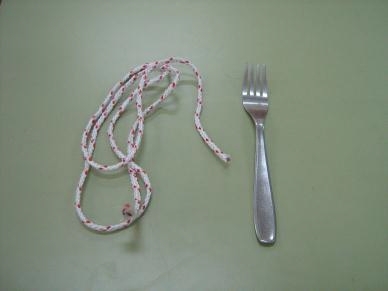 1.- Tie the middle of the thread to the end of the fork and wind the ends around your fingers. 2.- Swing the fork so that it knocks gently against the edge of the table. You will hear a dull clink. 3.- Touch your index fingers to the flaps just in front of your ears holes and let the fork hang down. 4.- Swing the fork so it knocks gently against the table again. What do you hear this time ? When the fork hits the table, it vibrates. This makes the air around it vibrate and you hear a dull clink. This makes the thread vibrate too. When you put your fingers near your ears, you bring the thread closer to the sound sensors in your ears. You can hear the vibration much more clearly. They now make a clear chiming sound in your ears. This tells us that sound must be able to travel through solids. 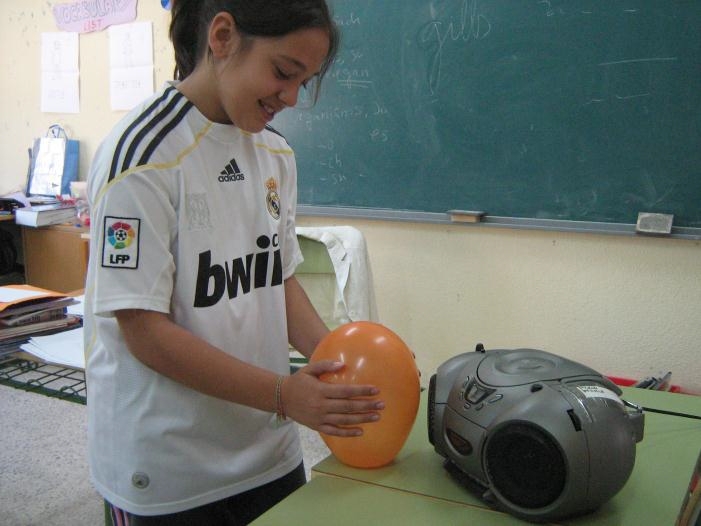 Sound can travel from place to place if there are particles in between to vibrate. Where does sound travel faster ? Where does sound travel faster : through a gas, through a liquid or through a solid ? 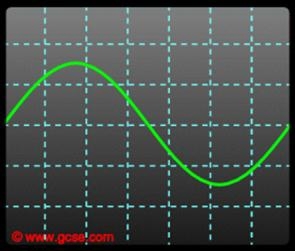 This is, more than an experiment, a demonstration to know through which state sound can travel faster. The children will act like the particles of a solid -they should be close together. 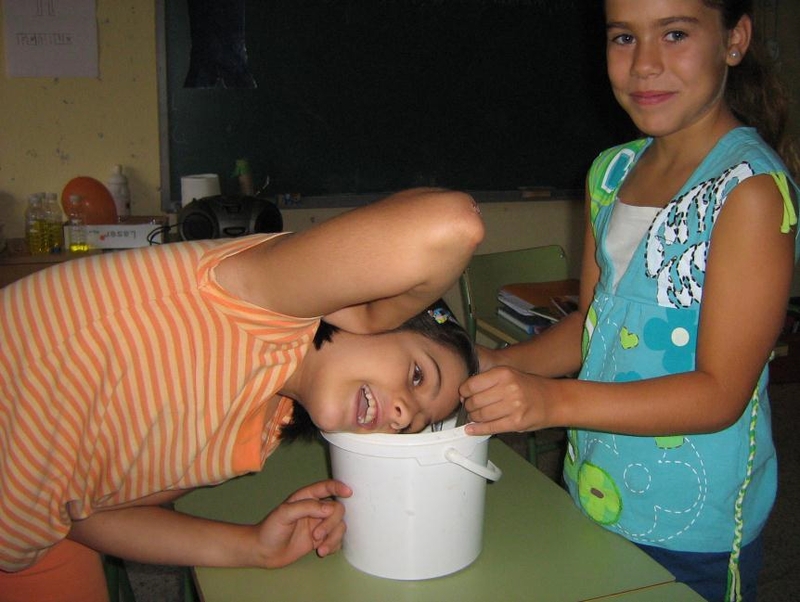 Prepare a chronometer and touch the child next to you at the same time as the chronometer starts. Each child has to touch the nearest one. When the last child has been touched, stop the chronometer. Record the time. Do the same but now the children will act like particles in a liquid -they should be a little bit apart one from each other. they should be far apart. In which state has the communication been fastest ? 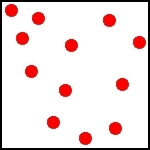 In a solid, the particles are arranged in a closely-packed structure ; when the particles vibrate at one end, this structure passes the vibration through the particles very quickly and over great distances. 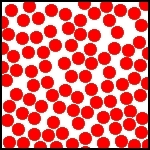 In a liquid, the particles are closer than in a gas but without the regular structure of a solid ; so the speed of sounds and the distance they travel are less than in a solid, but more than in a gas. In a gas, the particles are far apart and so the sound travels relatively slowly and for a limited distance compared to liquids and solids. 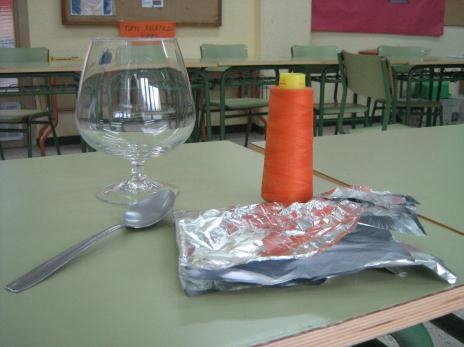 1.- Make a hole in the bottom of a plastic cup using a drawing pin. Push a pencil into the hole to widen it. 2.- Tie a couple of knots at one end of the string. 3.- Thread the string through the hole, so that the knots rest on the outside of the bottom of the cup. 4.- Wet the paper towel. 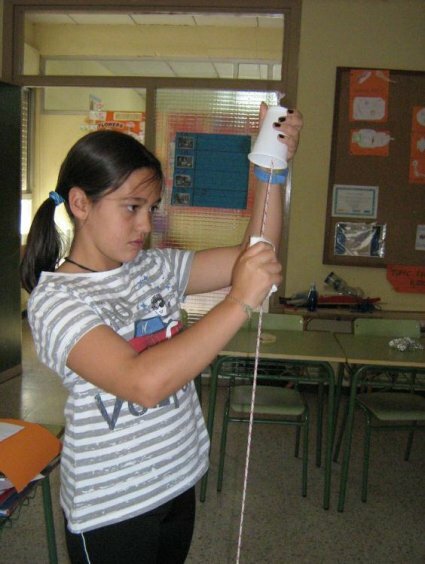 Hold the cup in one hand and drag the wet towel down the string with the other. What happens ? 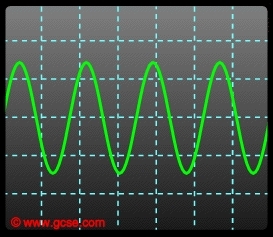 The pitch or frequency of a sound wave is the number of vibrations that occur in a second. 1.- Stand bottles in a line. 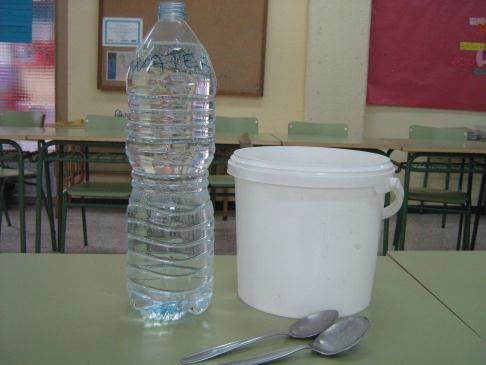 2.- Fill one bottle with a little water. Pour more water into each bottle in the line. 3.- Blow across the top of each bottle. 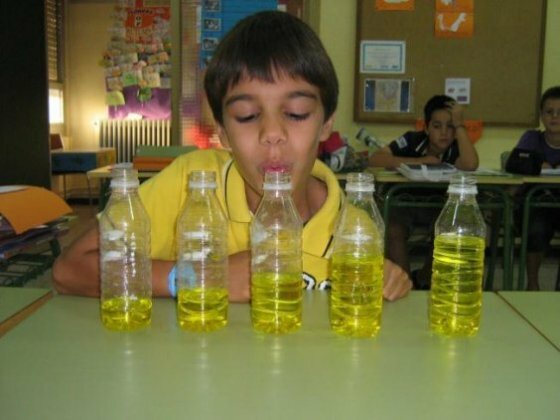 (If you can’t get a sound, change the angle, or how hard you blow) Which bottle makes the lowest sound ? Which bottle makes the highest sound ? 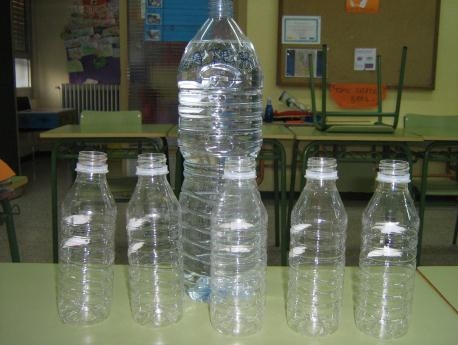 Blowing makes the air inside the bottle vibrate, producing a sound. The sounds change according to the amount of water and air in the bottle. The bigger the space between the water and the top of the bottle, the lower the sound. 1.- Line the glasses up and pour water into them. Fill the first right to the top, then each of the rest with a little less than the one before. 2.- Add a few drops of different food colouring to the glasses to colour the water. 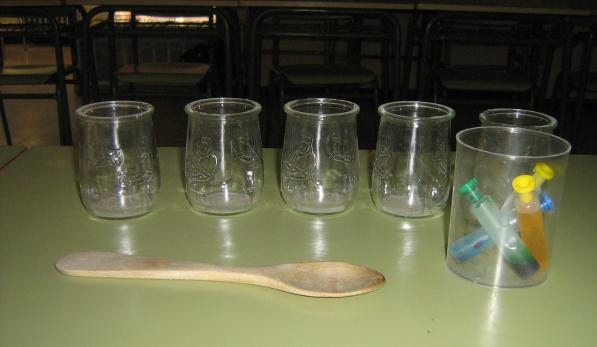 3.- Gently tap each glass with the spoon. Which glass makes the lowest sound ? Which glass makes the highest sound ? Four elastic bands : two of them the same length but different thickness and the other two the same thickness but different length. 1.- Stretch the elastic bands that are of different thickness over the box and pluck each one with your finger. Which one makes a higher sound ? 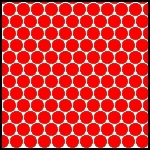 2.- Now choose two bands that are the same thickness but different lengths. Stretch them over the box and pluck them. Which one makes a higher sound ? 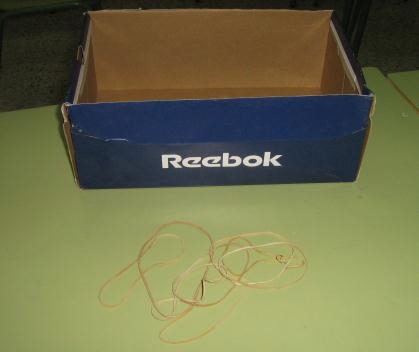 3.- Stretch the four elastic bands over the box. Pluck each one and arrange them in order, from the highest to the lowest. 1.- Listen to these two sounds. 2.- Which of these diagrams belongs to the first sound you have heard ?. Write number 1 in the circle. 3.- Label the diagrams. What is the pitch of each sound like ? • Low sound • High sound. 4.- Draw diagrams for the four sounds you hear, and write the correct label in the boxes : • Very high sound. 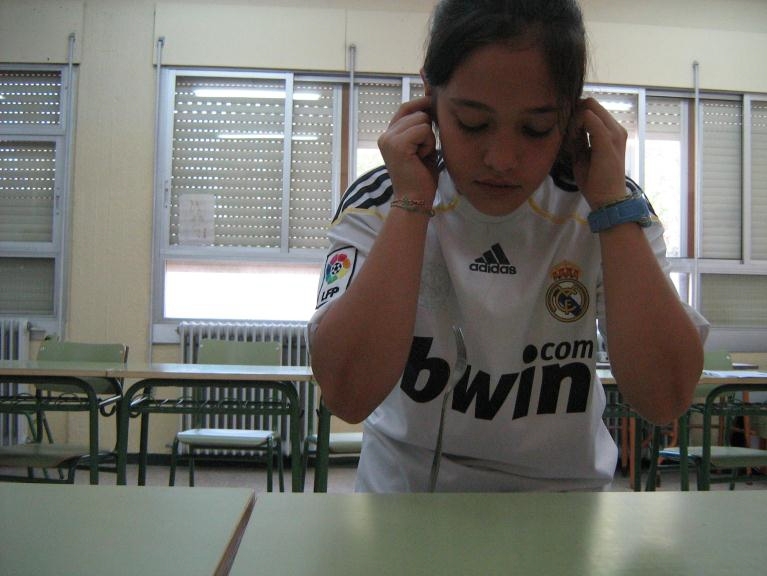 • High sound.